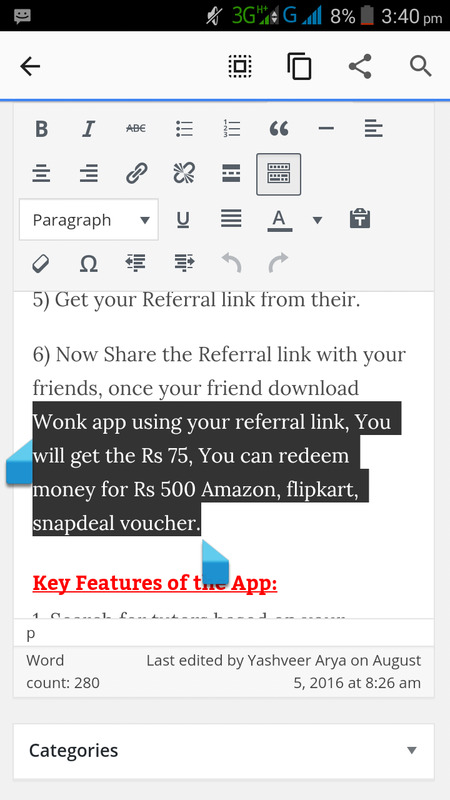 Wonk App – Get Rs 75 per Referral (Redeem for Flipkart, snapdeal, amazon voucher). With WONK, you can now search for verified tutors in your locality of choice and review & compare their educational qualification, employment details, awards & recognitions, tuition fees and ratings/feedback submitted by other users. Well Wonk app is offering Rs 75 per Referral. So Hurry up and Join Now !! 1) First of all, Expired now !! 2) Install and Open the Wonk app. 3) Register via Email or Facebook. 4) Now Goto “Menu” >> and click on “Invite & Get Rewarded“. 5) Get your Referral link from their. 6) Now Share the Referral link with your friends, once your friend download Wonk app using your referral link, You will get the Rs 75, You can redeem money for Rs 500 Amazon, flipkart, snapdeal voucher. 1. Search for tutors based on your specific requirements. You can choose Location, Course, Subject, Level, Gender & average rating for searching a tutor. 2. WONK will provide you with a list of tutors matching your requirement which you can sort & filter using the various options provided on the top right hand corner. 3. Listings based on proprietary logic to ensure optimum results for our users. You can also search for a tutor by his/her name. 4. Click on a tutor profile, access detailed information related to the tutor which includes educational qualification, location, employment details, awards & achievements, books authored etc. You can also review the ratings & feedback of a tutor as submitted by other students/parents. mha faltu.. bhai min. redeem value v update kiya kr 500 rs h .. jo refer ni kr skta utna wo faltu me apna tym to waste ni krega agr pta hoga redeem value to.. isse bus fyda admin ka hoga (tmhe to referral credit mil jayega) users (max.) ka tym and mb waste h.. so please mention kiya kr mere bhai..
Its already mentioned in this Post ( please refer screenshot ). + This Post is Based on Refer and Earn (Not Signup). here redeem value means min. redeem value. You should mention it clearly. I am not criticising u just suggesting. Obviouly u mentioned this but i think you should use min. redeem value is 500 which you usually does in many of ur posts but this tym you forgot my bro Anyway tx. Ok.. we are giving our best and trying to mentioned all Terms & conditions.